Are you looking for a fanciful, romantic and even glamorous breakfast to serve to a friend or loved one this Valentines Day? Want to make someone feel like they are royalty =)? Then all you have to do is prepare this exquisite, yet simple dish and serve it to that someone for breakfast in bed on a tray (or even cookie sheet) that you’ve decorated with a single fresh flower that you “borrowed” from the neighbors flower garden (I’m totallly kidding), along with a tall glass of freshly squeezed orange juice that you squeezed by hand with love (aww… Valentines is so cheesy :). I adore this french toast, not just love, adore! 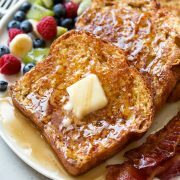 I created this recipe because I’d been making banana stuffed french toast for many years and wanted to switch it up a bit (I will post the banana stuffed french toast recipe sometime in the near future). It’s safe to say this is gourmet french toast, but not the gourmet thats like one string bean topped with a sliver of moldy “gourmet” cheese followed by some unknown meat and a drizzling of strange looking and smelling sauce. This is the gourmet like, tastes incredible, looks incredible and makes you feel incredible gourmet =). Also, if you’d like to decorate your plate with the strikeingly fancy red dots, simply fill a clean medicine syringe with seedless raspberry jam (I strained the seeds from my jam with a fine mesh strainer) then pipe small drops along the edge of the plate. I’ve mentioned in a previous post but I have to mention it again in case you missed it, here is the link to my favorite raspberry jam. I made it this past summer, thankfully I made half a freezer full. It’s so good I could eat it like soup. I never knew the less sugar recipe would be better than the average but I promise it is. Anyway, that’s the jam I use in this recipe and I don’t strain the seeds because I don’t mind them. Enjoy, and have a fun Valentines Day! You may also like to try my White Chocolate Raspberry Cheesecake, decadent and beautiful. 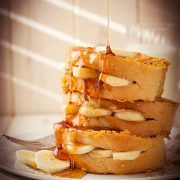 The most decadent french toast! The perfect weekend breakfast. Preheat a nonstick griddle over medium heat or an electric griddle to 325 degrees. In a mixing bowl, using a fork, combine Neufchatel Cheese and raspberry jam, stir until well combine and nearly smooth (it's ok if theres a few small lumps), set aside. In a blender combine buttermilk, milk, eggs, flour, baking powder, cinnamon, nutmeg, salt and vanilla. Blend on low speed for 10 seconds. Pour mixture into a shallow bowl, set aside. Pour crushed graham crackers or corn flakes into a seperate shallow bowl, set aside. Make a slit down the center of each slice of bread cutting about 3/4 of the way down (basically your making a butterfly, the bread should be slit down the middle but still connected). Spread 1 1/2 Tbsp of the raspberry mixture on one side of the inside of each slice of bread where slit was made, then very gently press bread together. Butter preheated griddle and dip one side of filled bread into milk/egg mixture (giving it a few seconds to soak up mixture and being carefull not to immerse the center filled with raspberry mixture) then flip and dip opposite side several seconds. Allow a bit of the excess to drip off then dip and coat both sides in crushed graham crackers. 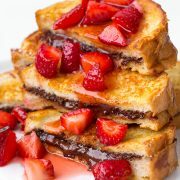 Place coated slice on preheated buttered griddle and cook until golden brown (about 2-3 minutes) then lift french toast with a spatula, butter griddle again and flip french toast. Cook opposite side until golden. Repeat process with remaining slices of bread. 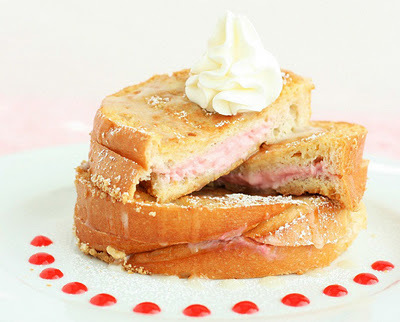 Serve cooked french toast immediately along with vanilla cream syrup and optional sweetened whipped cream. 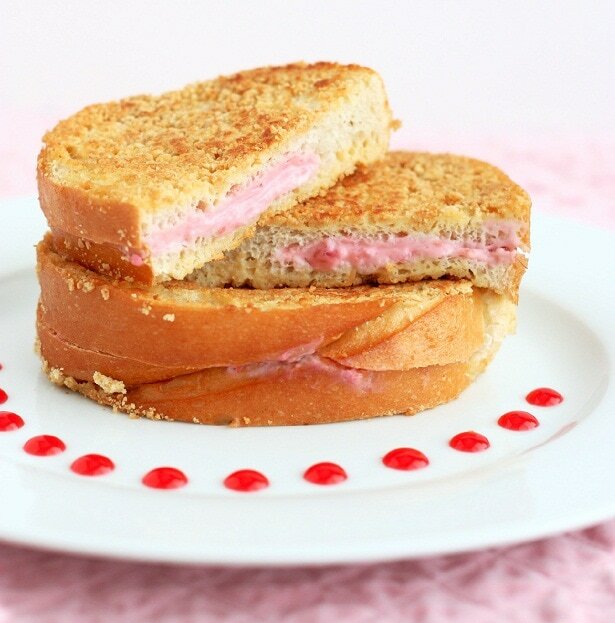 Lisa H.: This looks amazing and I’m sure it will taste amazing as well! Thanks for sharing! I hope you have a wonderful Valentines day!